Globular clusters are immense groups of stars, usually a hundred or two light years in diameter, which contain hundreds of thousands or even millions of stars. They are mostly found in a roughly spherical region centered on the nucleus of our Galaxy, but even if they were to pass through the Galaxy their thickly clustered stars -- often tens of thousands of times more numerous than the stars in the Solar neighborhood -- would easily exert enough gravitational force to overcome the disturbances caused by other stars passing through the cluster. Because globular clusters are so thickly strewn with stars, stars can sometimes collide inside such clusters -- something which almost never happens anywhere else in the galaxy -- creating more massive stars (if the stars merge), exceptionally close binaries or catastrophically violent collisions. The vast majority of the stars in the clusters are fainter than the Sun because the clusters are invariably very old -- typically more than ten billion years old, and in some cases almost as old as the oldest galaxies. 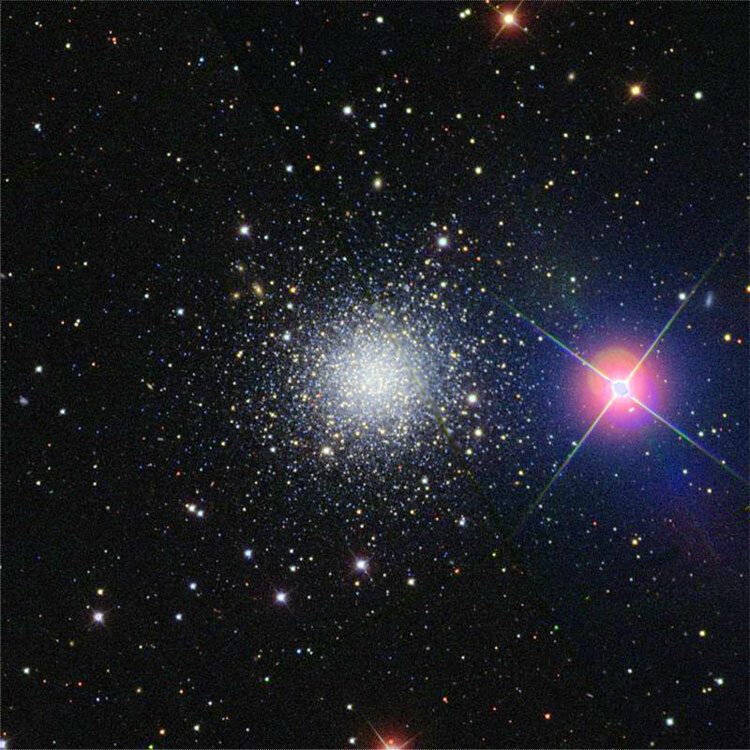 Brighter stars in globular clusters are usually Red Giants -- stars in the process of dying -- or much more rarely the result of the collision and merging of smaller stars. 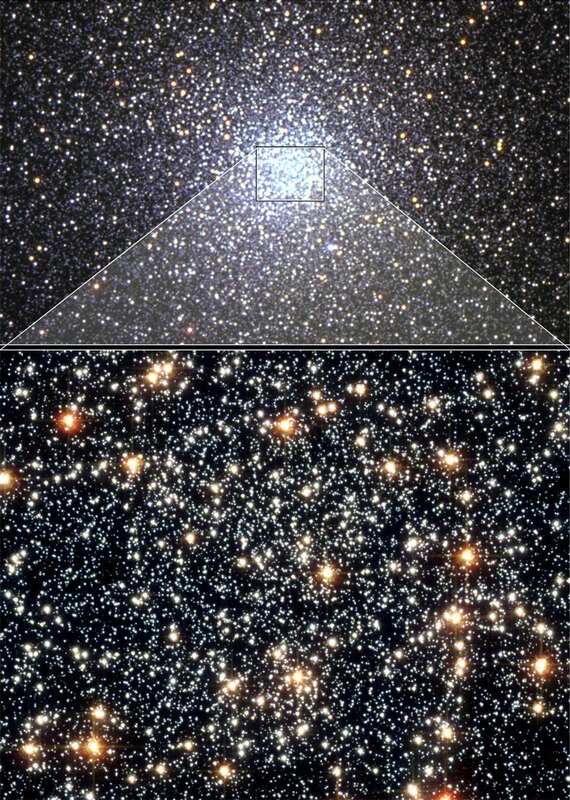 Shown below are two images of the globular cluster in Hercules, M13, one of the best known globular clusters because its position places it high in northern skies during late spring and summer evenings. Approximately 25,000 light years from our Sun, nearly a million stars are packed into its 150 light year diameter. 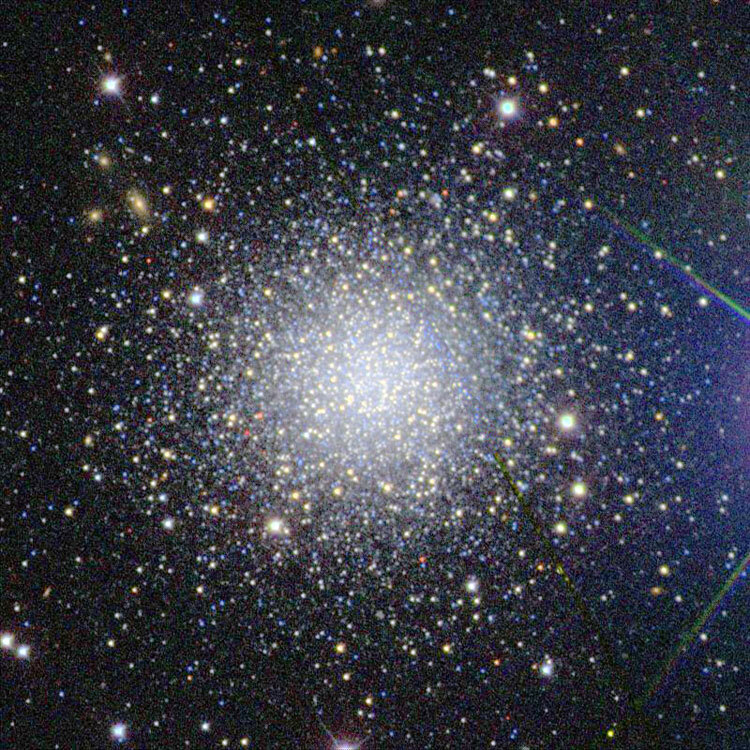 Historical Identification: Per Dreyer, NGC 104 (= Lacaille Nebula list, #1, 1860 RA 00 17 47, NPD 162 51.6) is a "globular cluster, very remarkable, very bright, very large, very much compressed middle". The position precesses to RA 00 24 03.4, Dec -72 05 01, about 0.5 arcmin west of the center of the cluster, which is a negligible error in comparison to its nearly half-degree diameter, so the identification is certain. 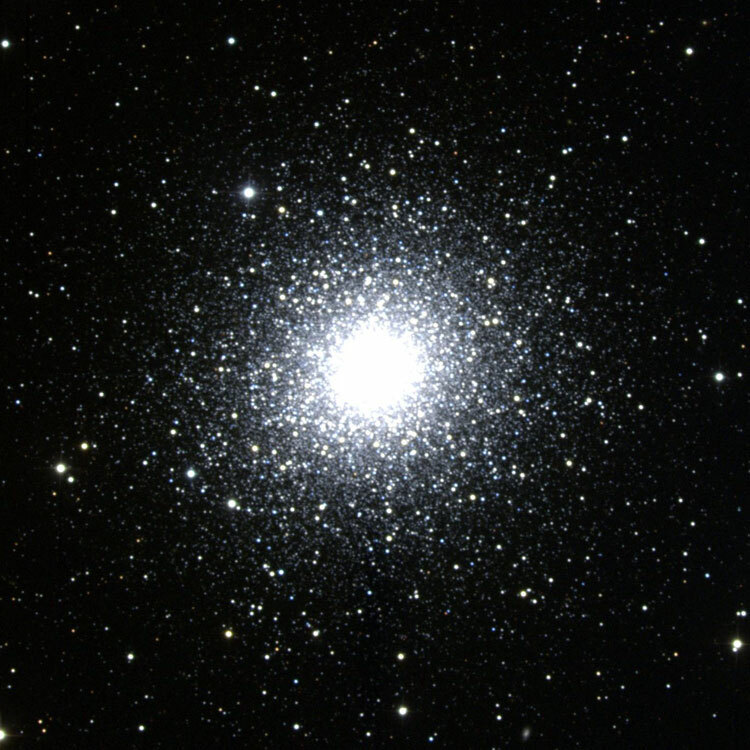 Because of its brightness NGC 104 is visible without optical aid in a dark sky, and was therefore labeled by Flamsteed as a starlike object, 47 Tucanae. Physical Information: NGC 104 is the second largest and brightest globular cluster in our galaxy, exceeded only by Omega Centauri (NGC 5139). Even at a distance of 16 to 18 thousand light years its 120 light-year diameter is as large as the full moon, and contains several million stars. If the Sun were in the center of the cluster our sky would be filled with brilliant stars, since more than ten thousand stars would lie within the 4 light year distance to our nearest neighbor (α Centauri). Based on studies of the Main Sequence turnoff point, the age of 47 Tucanae is estimated at 10 billion years, more than twice the age of the Solar System, but two to three billion years younger than the oldest globulars in our galaxy. 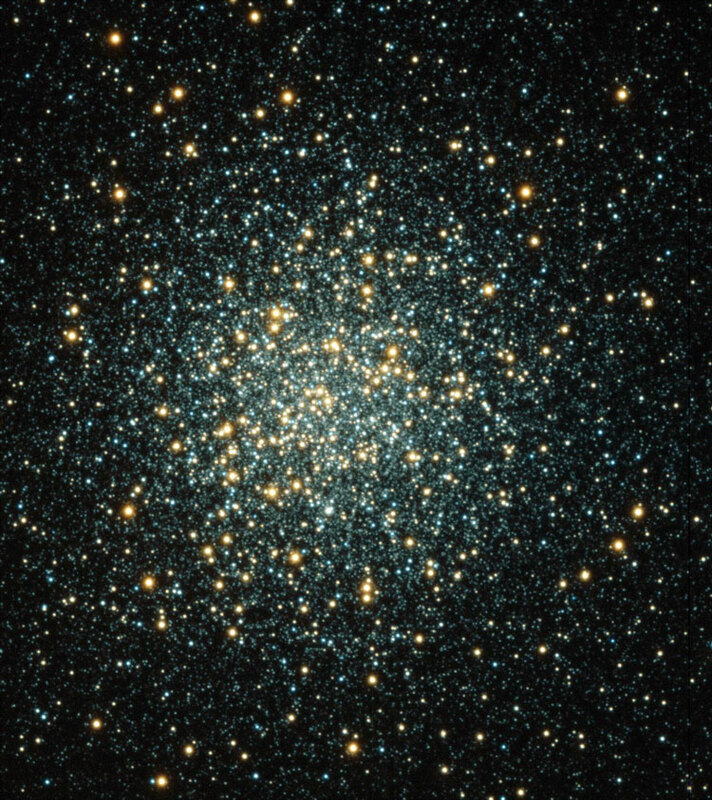 NGC 104 was recently used to prove a theory of stellar mass sorting by globular clusters. More massive stars tend to settle to the center of the cluster, while less massive ones spread out over a larger region. 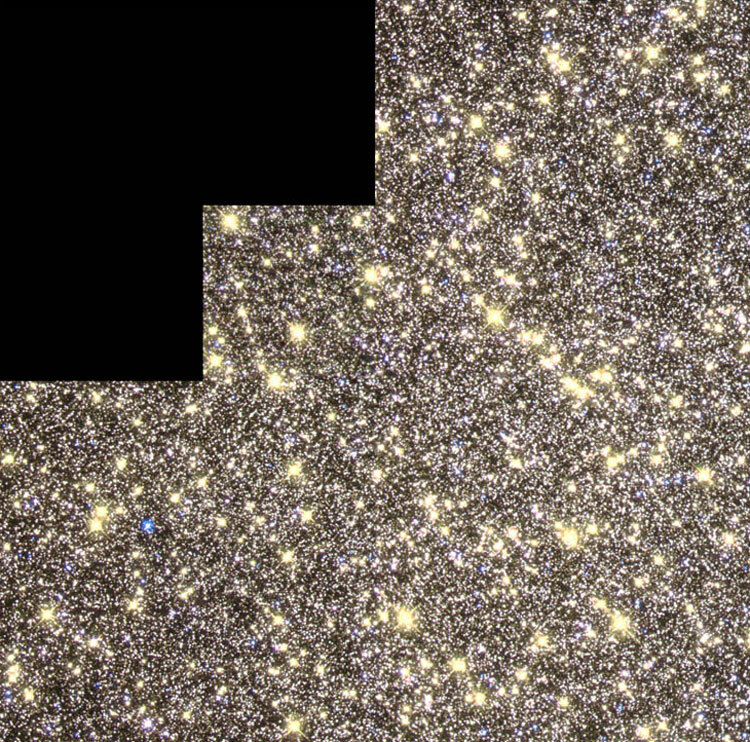 To prove that 130 thousand stars within the central 12 light years of the cluster were studied for seven years, using techniques that allowed movements as small as 1/100th of an HST image pixel to be detected. "Blue stragglers", Main Sequence stars located well above the cluster's turnoff point, were shown to be moving more slowly than stars of more normal mass. (The "stragglers" are believed to be produced by collisions between normal mass stars, which are virtually impossible in normal regions of stellar space, but fairly common in the densely packed cores of globular clusters.) Aside from showing that heavier stars were moving more slowly, the study ruled out the possibility of a supermassive black hole in the region (which would have required faster speeds for all the stars). Historical Identification: Per Dreyer, NGC 5139 (1860 RA 13 18 24, NPD 136 34.8) is "a magnificent object(!!! 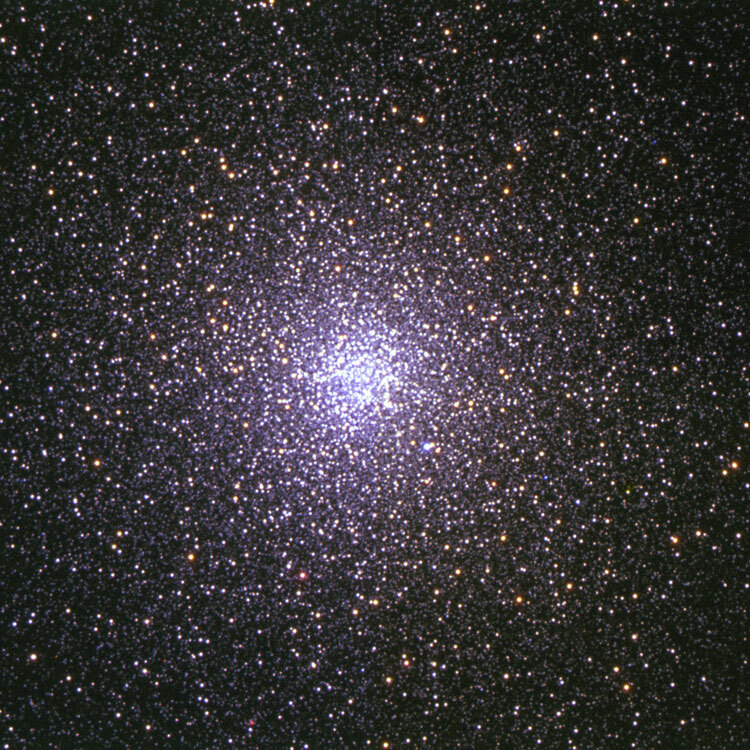 ), a globular cluster, ω Centauri". The position precesses to RA 13 26 44.9, Dec -47 18 35, almost 10 arcmin north of the center of the cluster, but there is no mistaking the identity of this spectacular object. 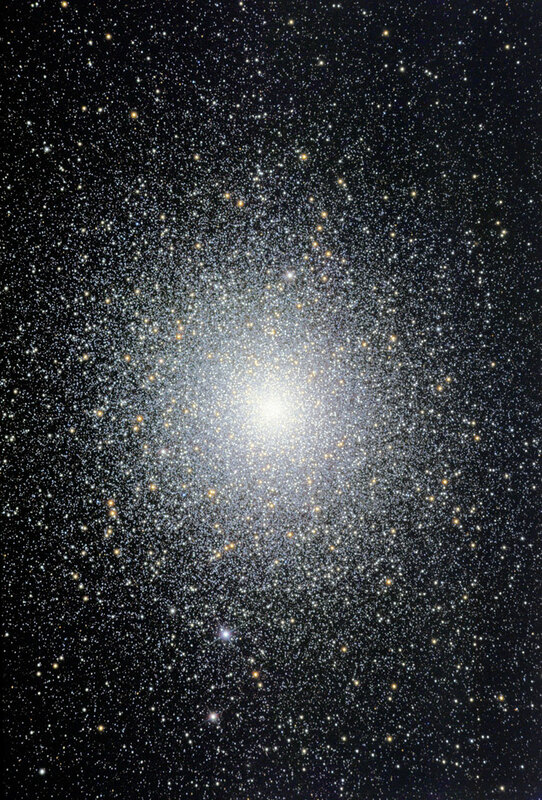 Physical Information: Bright enough to appear a fuzzy star to the unaided eye in a dark southern sky, Omega Centauri is the largest, most massive and brightest globular cluster in our galaxy. For reasons discussed below it has even been suggested that it is not a true globular cluster, but the core of a dwarf galaxy captured by our own galaxy and stripped of its outer regions. The cluster is about 15 thousand light years from Earth, yet still appears larger than the full moon (its outer regions covering a region nearly 40 arcmin across), and packs over ten million stars into its 150 light year diameter. Most of the still visible stars are low-mass, faint stars, as even stars like the Sun would be getting close to the end of their lives after the nearly twelve billion years since the cluster formed. Still, the cluster does contain a number of much brighter "red giants" (particularly notable in the HST image below), the result of stars at the end of their lives swelling to planetary orbital sizes before collapsing to faint white dwarfs (more massive stars could become neutron stars or black holes, but all such stars which once filled the cluster with their brilliant light must have died many billions of years ago). It also has a substantial number of "blue stragglers", relatively bright hot stars with about twice the mass of their far more numerous companions, created by the collision of two stars in the dense central parts of the cluster (in regions such as the Solar neighborhood such collisions are impossible, because stars are so small compared to their separations; but in the cores of globular clusters, where tens of thousands of stars occupy the space normally occupied by only one or two stars, collisions are hundreds of millions of times more likely). The cluster is unique in several respects, one of which is its rotational velocity. 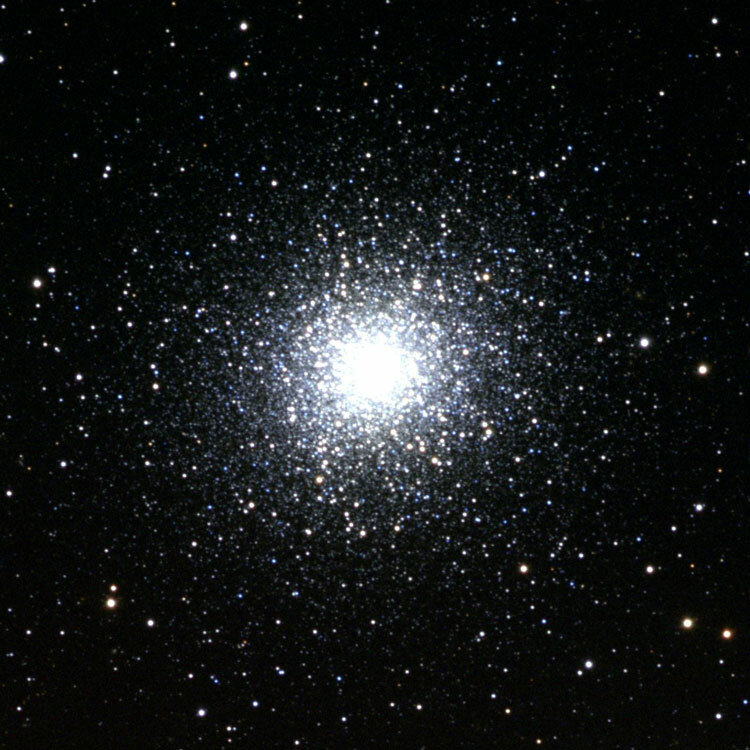 Most globular clusters have no net rotation, the stars they contain simply moving around in random directions under the influence of the overall gravity of the cluster and their nearest neighbors; but Omega Centauri is rotating at about 8 km/sec, and should complete one rotation every 15 to 20 million years. It also contains stars of varying chemical composition, suggesting that some were formed earlier, when the Universe contained virtually nothing but hydrogen and helium, and others later, after the death of earlier generations of stars seeded the space between them with the ashes of their destruction. 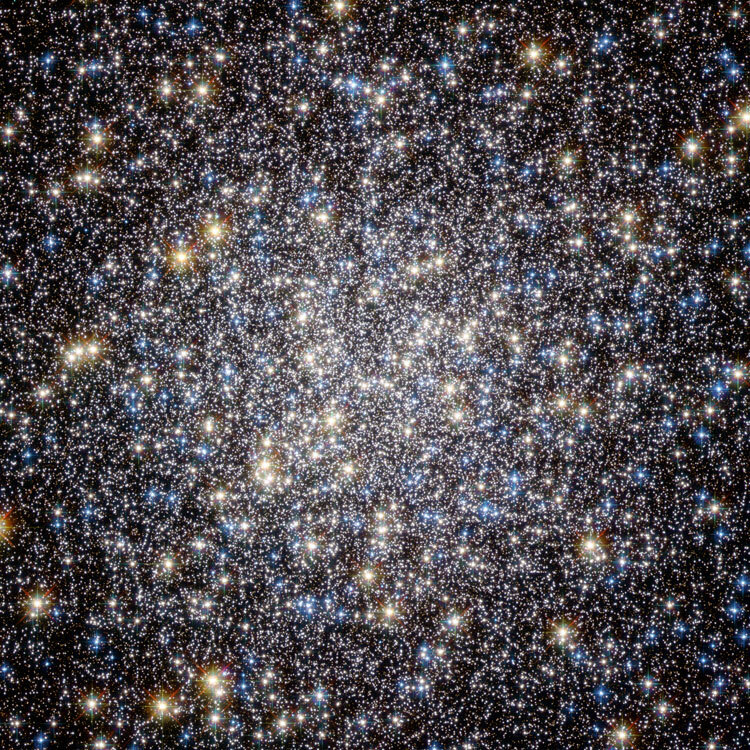 This is consistent with the hypothesis that the cluster is a captured galaxy in which star formation went on for some time; the more normal situation for globular clusters is for virtually all of the stars to form in a relatively short time, and have nearly identical chemical composition. NGC 2419 (= PGC 2802643): "The Intergalactic Wanderer"
Physical Information: NGC 2419 is one of the most distant globular clusters in our galaxy; in fact until recently it was thought that it might not be a permanent part of our halo at all, and was referred to as "The Intergalactic Wanderer". However, it is now believed that it is orbiting the Milky Way, though in a path which takes it beyond the Magellanic Clouds (it is currently nearly twice as far away as the Large Magellanic Cloud), with an orbital period of around 3 billion years. Based on it and the Sun's relative locations NGC 2419 is about 275 thousand light years from the Sun and 300 thousand light years from the galactic center. Given that and its apparent size of nearly 5 arcmin, it is about 400 light years across, making it nearly three times the diameter and thirty times the volume of the next largest Milky Way globular, Omega Centauri. 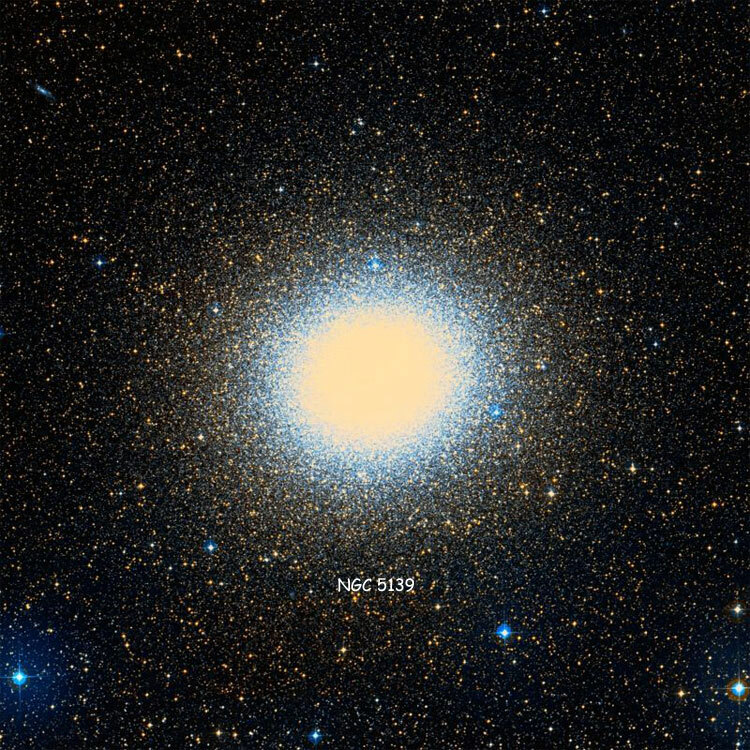 Omega Centauri contains ten to fifteen million Solar masses, so if NGC 2419 has a similar density, it could have a mass of three or four hundred million Solar masses, more than that of many "dwarf" galaxies. Even if its concentration of stars is considerably less, it must have the best part of a hundred million Solar masses, and far outstrip any other Milky Way globular cluster in every respect. 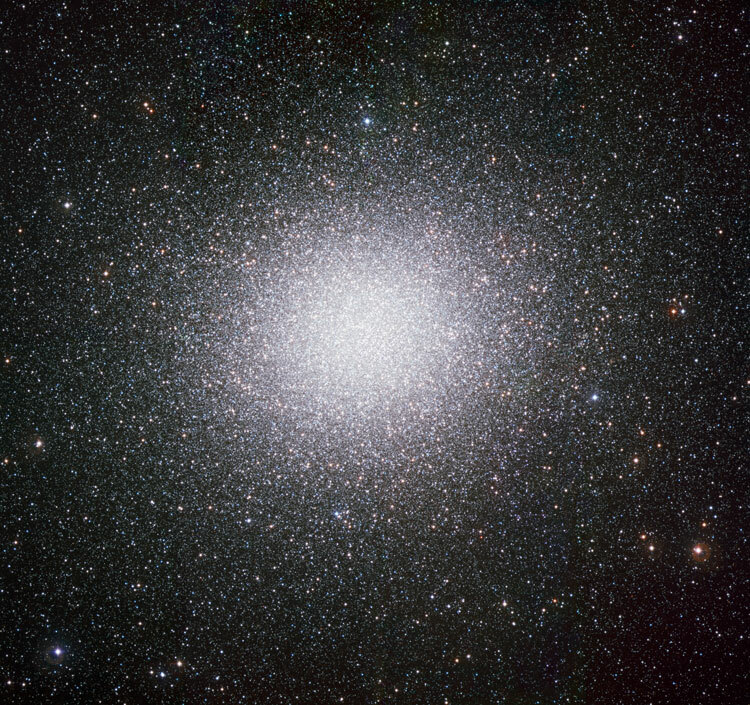 If it were as close as Omega Centauri it would be a 3rd-magnitude fuzzball nearly two degrees in diameter, and as easily visible to the unaided eye as the Magellanic Clouds; and being north of the Celestial Equator, would be one of the most spectacular objects in the northern sky.